Love dice? Las Vegas has a lot of 'em! Ah, Las Vegas. Gambling. Sun. Sin. Drive through marriages that last less than a day. Elvis! It’s a wild, fun place. 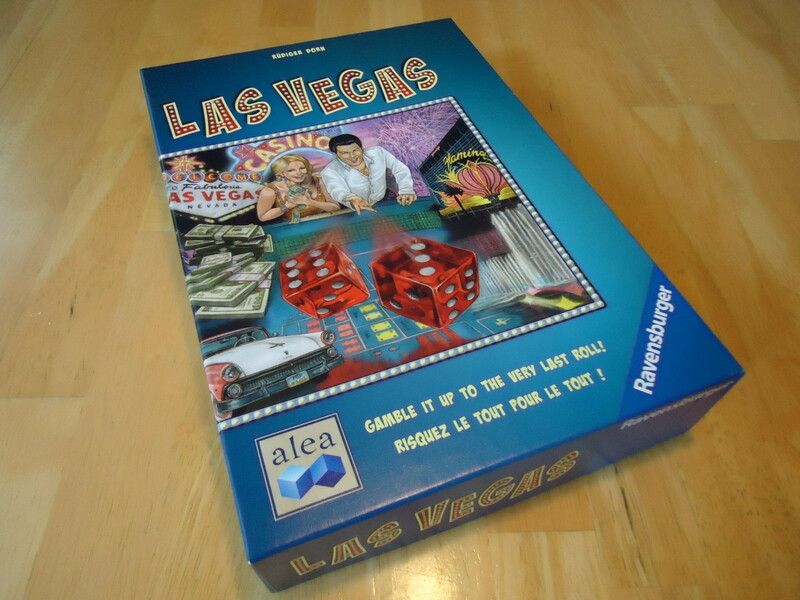 While the game Las Vegas can’t hope to capture all of the fun you can have in Vegas (or all of the damage you can do to yourself), it does try to capture at least a bit of the gambling fever in a fast paced dice game. You’ll have to provide your own Elvis, though. Las Vegas is a simple area control game. 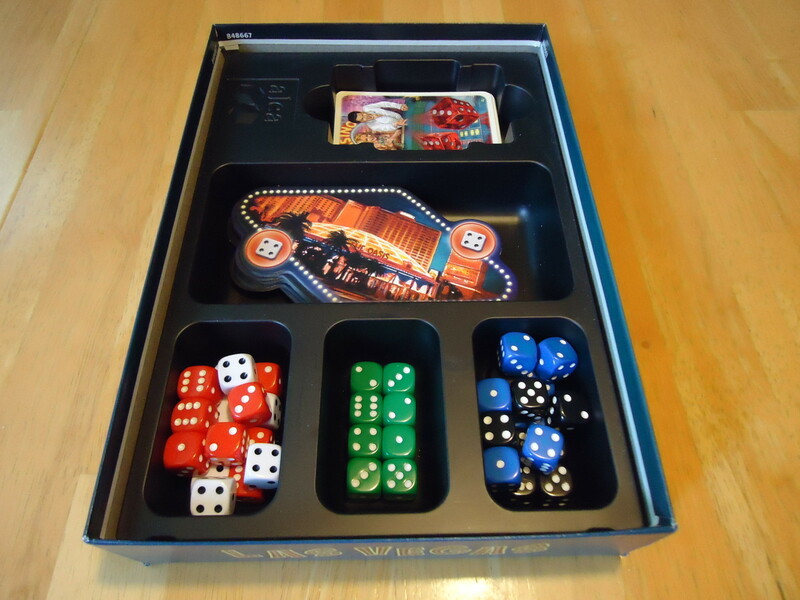 The object of the game is to use your dice to gain control of the most lucrative casinos. 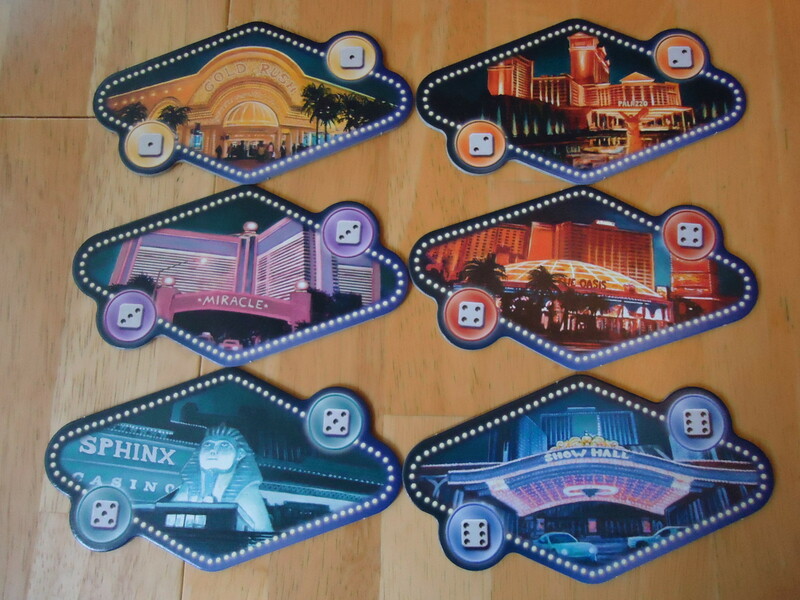 At the beginning of the game, six casino tiles are laid out on the table in order of dice value. The banknote cards are shuffled and dealt out on each casino until the total for each casino is $50,000 or greater. Some casinos may end up with just one card and others may have more than one. Nearing the end. The final payout will determine the winner. Roll all of your dice on your turn. You’ll have eight dice at the start of the game and less on subsequent turns. Choose one of the numbers you’ve rolled and place all of those dice on the matching numbered casino. Play then passes to the next player. When your turn comes around again, you will roll any dice that you have remaining and repeat the dice placement. Play proceeds until all players are out of dice. This completes the round. If multiple players have the same number of dice on the same casino, it’s a tie and those players remove their dice. None of the tied players will get any money from that casino. Starting with casino number 1, the player with the most dice remaining on a casino takes the highest numbered (or only) banknote from it. Any remaining banknotes on the casino are distributed to the remaining players in descending order. The player with the next highest number of dice takes the next highest banknote and so on. If there are more players on the casino than banknotes available, those players receive nothing. Any banknotes that remain after the payout are removed from the table and placed at the bottom of the banknote pile. After all six casinos have paid out, replenish the banknotes on each casino so that they again have at least $50,000 each. The player to the left of the previous starting player becomes the starting player for this round and play begins again. Play proceeds for four rounds. At the end of four rounds, add up your banknotes. The player with the highest amount of money wins. There are variant rules using neutral dice that increase the tension and decisions you have to make in the game. Each player gets a certain number of neutral dice (determined by the number of players) in addition to their eight regular dice. 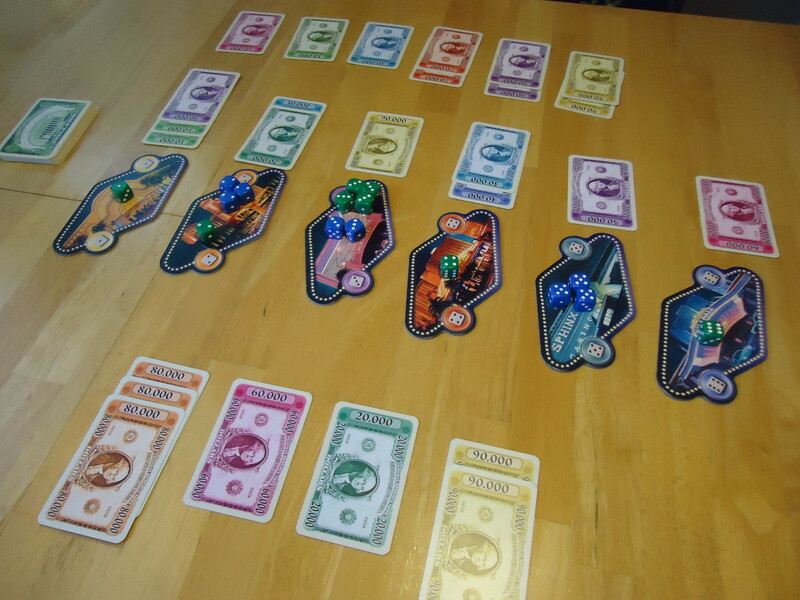 The neutral dice are rolled placed, and score in the same ways as the players’ dice, except any money won by the neutral player is simply removed from the game and is not given to any active player. It’s as though each player is controlling a portion of a “ghost” player in the game, trying to make the ghost help themselves and hurt their opponents. Viva Las Vegas or I’d Rather Stay Home? The easiest thing to notice first about any game are the components, and while the components for Las Vegas are functional, they’re also nothing special. The dice are standard six sided dice and the casino tiles are thick cardboard. The casino artwork is nice, but not overly impressive. 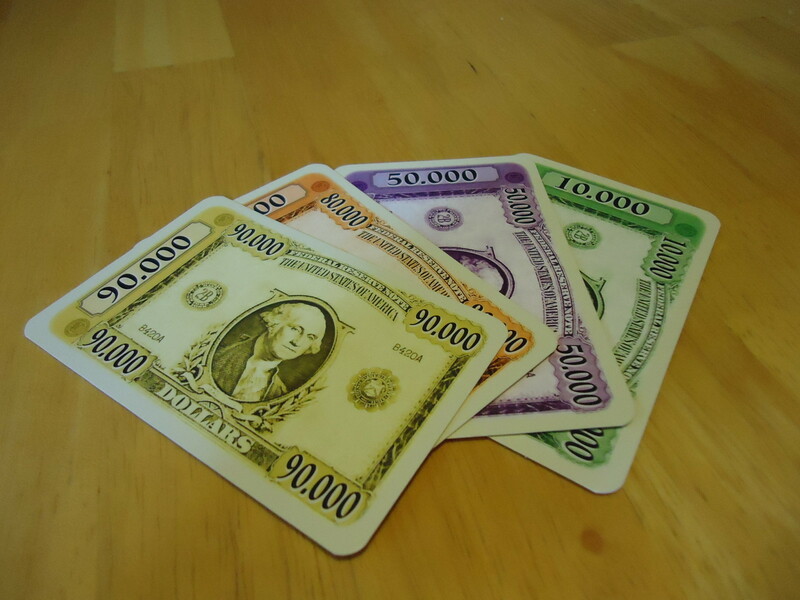 The banknotes are printed on good card stock, which is a plus as Ravensburger/Alea could have gone with paper money. The thought of that makes me shudder. Had they included poker chips, though, that would have really set this game apart and made the theme shine through. I guess they opted for cards to keep the price lower, but I recommend buying or using some decent poker chips as it gives a boost to the overall feel and flair of the game. Money, money, money! Why couldn’t they be poker chips? As it is, the gameplay fits the theme well, even though the components don’t do a lot to push the theme. Rolling dice, placing them on the casinos, and taking your payout at the end of a round does feel a bit like sitting at a table in Vegas and either winning big or losing your shirt. Las Vegas is simple to learn and fast to play. The limited ruleset makes it ideal for families and non-gamers. It’s a good game to open a game night or to play as a beer and pretzels game while watching football or entertaining family. Since it doesn’t require a lot of concentration to do well, it’s the type of game you can play while other things are going on around you. The components will easily fit in a bag, making it a good game to take on vacations or picnics. It’s also easy to add extra players by buying some more dice in other colors. It’s easy to see why Las Vegas was nominated for the SDJ in 2012. It is accessible and family oriented. The game is a good introduction to the area control genre. You have to decide how to best manage your resources (dice) to secure control of the most lucrative casinos. Do you want to use a lot of dice on an early turn to guarantee control over the highest paying casino, or do you want to use your dice sparingly in the beginning so you’ll have more to use at the end of the round to snap up casinos when other players are out of dice and can’t stop you? Do you try only for the high value casinos, or do you settle for a handful of second place finishes which can quietly push you ahead? You can try to determine a strategy at the beginning of the game once you see how the casinos are valued, but you’ll probably find your strategy shifting as your opponents place their dice and the odds go up or down in your favor. Love dice? Las Vegas has a lot of ’em! Because of the randomness of the dice, sometimes there are no good moves you can make. In those cases you’ll have to choose the least damaging option. This is especially true when playing with the neutral dice variant. 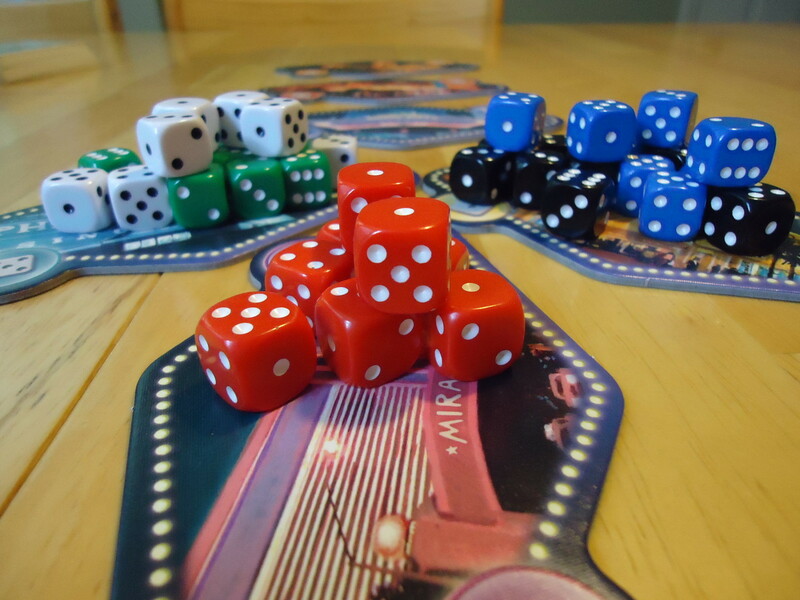 The neutral dice can help you wrest control of a casino from another player, but if they are unkind it can mean ceding control to another player. For example, if you have a one die majority of casino number five and you roll your last neutral die and it comes up with a five, you must place it on casino number five. Depending on the other players’ placements, this may mean that you will tie with the neutral player and neither one of you will get any money. Worse, your tie may hand the casino over to another player. Which brings me to a major issue with the game: The base game is very limited. The choices are few and the strategy is almost non-existent. It’s really best played with kids or people who never play anything more complex than Sorry. This is especially true at lower player counts. With just two or three players there isn’t enough competition for the casinos to make the game engaging. Not to say that you’ll always win, because you won’t. You’re still at the mercy of the dice, after all, but the decisions are pretty obvious. The variant rules don’t turn the game into a heavy brain burner, but they do add tension and competition. It feels like the variant should have been the main ruleset. With each player controlling a portion of the neutral player you have more opportunities to shift the balance of control from other players to yourself, or at least to deny them the big scores. You can also completely ruin your own plans if the dice are unkind. People who hate direct conflict, screwage, or when random events screw up your own plans should avoid the variant rules and might want to avoid the game altogether. I like Las Vegas but I don’t love it. It’s a fun game but there’s not much here, especially if you’re playing the base game. Even playing with the variant rules doesn’t beef it up enough to hold my interest for long. I often find myself yawning during the third round or so and that’s not a good sign. It’s not the randomness that bothers me; that fits with the Vegas theme, after all. It’s that the mechanics aren’t groundbreaking and the components/theme aren’t interesting enough to overcome the tedium of rolling and placing dice while having very few opportunities to make solid decisions. At least it’s a very quick game that doesn’t overstay its welcome. It’s a game I’ll play if asked, but not one that I’ll reach for very often. It's a dice based game so your decisions are dictated by your dice rolls. Worse, the dice can fall in such a way as to hurt you, as much as your opponents.